Whether you’re planning to catch and cook or just cook and eat, you’re perhaps asking yourself what does bass fish taste like? With the various species of fish falling under the category of bass, the answer may not be as simple as you’d like. Like many fish, sometimes it’s the way it’s cooked that can have the biggest impact on flavor. So with that in mind, we’ve put together a short guide to help you out with taste and texture, as well as help you cook it. What Is Bass, Can I Eat It And Where Is It Found? Bass can be found in many countries around the world and is often considered one of the most popular, if not the most popular, freshwater game fish. There are actually many different species that fall into the bass category, which can include both freshwater and saltwater species. > What about catching bass? Yes, you can eat bass (you probably already knew that). Whether it’s freshwater bass or saltwater bass, as long as it’s well cooked it can be a safe fish to eat. It can be rich in protein and vitamins, as well as being relatively low in calories. However, as with some other types of fish, bass can contain mercury, which can be poisonous if consumed in large amounts. For this reason, you shouldn’t eat more than six portions of bass per month. Striped bass, in particular, should be avoided if you’re pregnant or nursing - this may also be a good recommendation in the case of largemouth or black bass. Children should also avoid eating it. For other people, it’s recommended that you don’t eat any more than four portions per year. There may also be a risk of listeria from eating contaminated bass. You might also find that some bass from certain bodies of freshwater are not safe to eat so it can be worth checking in advance if you plan to catch fish to eat. There are several species of bass fish that are native to North America and many of them can be found all across the USA, as well as in Canada, Mexico and further south into Central America. Many streams, rivers, lakes and ponds can be home to species of freshwater bass, which is what possibly makes them a popular catch for anglers. Sea bass tend to be found in the coastal waters of the United States from the Gulf of Mexico to the Atlantic as far north as Maine. They tend to be found near underwater structures. In the UK, bass fishing is restricted due to a decline in the numbers of sea bass available. 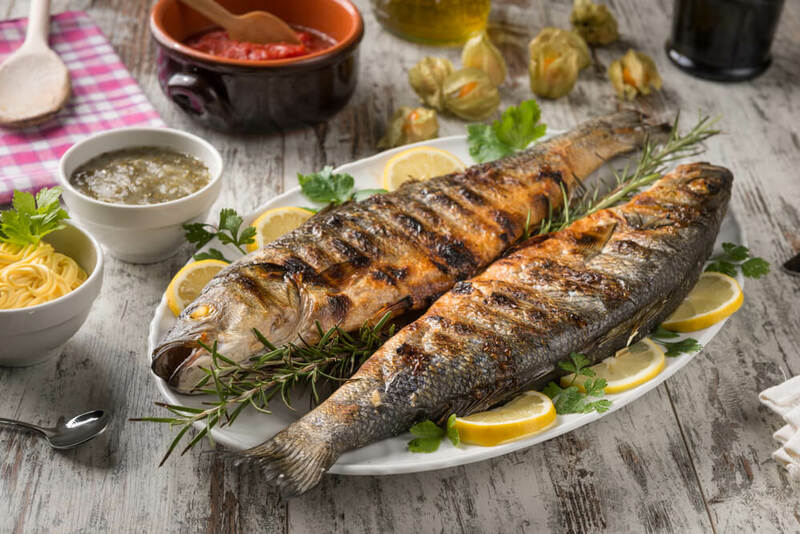 From throughout 2018 there have been strict regulations in force, limiting your catch to just one sea bass per day. In the UK, European sea bass are mostly found around the southern coasts of England and Ireland. However, this species is more commonly found in the warmer waters of the Mediterranean. Australia has its own species of bass, the Australian bass, which can be found in rivers and lakes along the east coast from Queensland to Victoria. While they’re a freshwater fish, they can be found in coastal estuaries during the winter breeding season. Other species of bass can be found in the deeper waters off the coast of New Zealand. What Does Bass Actually Taste Like? Sea bass has a mild flavor, which can make it a good choice for using in many recipes. It has a white meat with a firm but tender texture and can be ideal for cooking whole or in soups because it shouldn’t break apart as easily as fish with flaky textures. Also known as black bass, largemouth bass has a white meat with a firm, tender texture but it can have a fishy flavor that some people might not like. It may have a more meaty texture than flaky but it can also have very few bones within the meat. It can be fried or grilled and you could add it to other recipes. Smallmouth bass may have a more preferable flavor to largemouth bass as it can be tastier. But this can be down to personal preference and how the fish has been cooked. You might also find they have a sweeter taste than a largemouth bass. Similar to smallmouth bass, the meat has a firm texture. It has a white meat that can be mild in flavor without the overly fishy taste that might put some people off. Its mild flavor could make it a good choice for a variety of recipes, as well as being ideal for being simply fried or grilled. 2. Mix the paprika, onion powder, garlic powder, sea salt and lemon pepper in a small bowl. 3. Coat the fish with the mixed seasonings. 4. Melt the butter with the garlic cloves and parsley in a small pan over a medium heat. 5. When the butter has melted, remove pan from the heat and set to one side. 6. Lightly brush oil onto your grill and place your fish on top. 7. Grill the fish for around 7 minutes before turning. 8. Once turned, drizzle your melted butter over the fish and grill for another 7 minutes or until cooked. 9. Before serving, lightly drizzle olive oil over the fish. With bass being found in many places all over the world and even on many restaurant menus, knowing how it tastes can be useful. Hopefully you now have a better idea of what bass is and what it might taste like. Make sure you keep in mind the mercury levels if you’re planning to feed women or children and remember to watch out for any contamination that may be present if you’re fishing in freshwater. Let us know if you have a favorite bass recipe and feel free to share this with your friends if you think they could use a little help.